What is document management? Let's face it, talking about document control or document management is probably not a topic you would pick to be the life of the party at a social gathering. 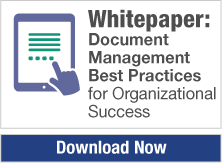 However, understanding document management can make a major impact for your organization. Here, we will cover the fundamentals of document indexing and retrieval all the way through business process management. Documents come in the form of both paper and electronic. An invoice that comes in from a vendor in the mail is obviously a paper document that can be read and a cted upon. However, that invoice probably started with an order from your business. That order might be an electronic record in the accounting system. Now we have two related documents that need to be kept together for reference, yet they are very different in how they are stored. This is a simple example. We could have complicated the example by adding a delivery receipt, an acceptance document, or even a contract. Again, these other documents could be in different formats or different systems. Worse yet, they might be in different departments. A contract might be stored in a file cabinet in the legal department. The delivery receipt could be at a warehouse or on the loading dock. The acceptance could be at the functional department that finally received the order. Now we've added different groups of people who may be in different physical locations. Here's the question: What if something was wrong with the order? Where do we find all the documents so we can review the contract, look at the delivery ticket to make sure all the materials were delivered, look at an acceptance from the department, look at the invoice and determine if we paid it? Without all of the documents, it can be very time consuming to resolve an issue. 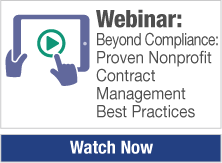 Not only does a lack of document control take away valuable time from multiple people in your organization, think of what was not being done while your staff is looking for documents. NEXT PAGE >> What is Document Capture?